The paper making takes place on the slope of Shikoku Karst Mountains in Yusuhara, Kochi Prefecture. 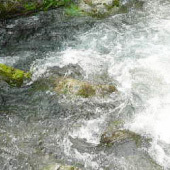 With its altitude of 650m and springwater from the shimanto river, it is a beautiful and rich place. 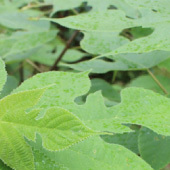 The paper making begins with the careful organic cultivation of the raw materials such as Kozo and Mitsumata. 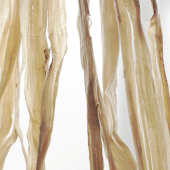 Once harvested, the branches are steamed, peeled and dried. 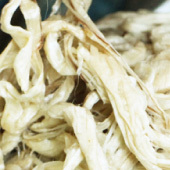 To reveal the white fibers the outer fibers are removed. 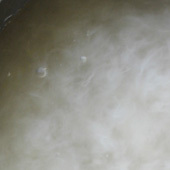 The fibers are cooked in limestone water as it has been done in the Tosa Washi tradition. The next step is to bleach the fibers in the strong sun known in Tosa (the old name for Kochi prefecture). 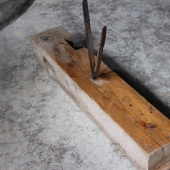 The hand beating can only begin after careful cleaning of imperfections in the fibers. The beaten fibers are mixed with Tororoaoi in the wooden basin and finally the paper can be made. The process is completed after drying the paper sheet by sheet in the sun on wooden boards. What Rogier aims to make is richly patterned and beautiful paper crafted out of his lifetime devotion to tradition and his pursuit of new techniques while living and working close to nature.